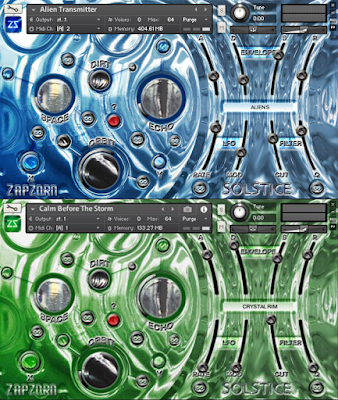 SAMPLE SOUND REVIEW: 70% off “The Solstice Bundle” by Zapzorn- Incredible Limited Time Deal!! 70% off “The Solstice Bundle” by Zapzorn- Incredible Limited Time Deal!! Incredible Sound Design Bundle for Kontakt! Both “Solstice: Blue” and “Solstice: Green” two sample libraries for Kontakt that combine multiple elements to produce an overall sound that is always evolving and never repetitive. Both instruments already come packed with an extensive collection of presets that will provide hours of inspiration, however if you’re feeling really adventurous, you can put your OWN sounds into Solstice and use it’s powerful interface and effects engine to transform them into something that is uniquely yours!